Over the course of the 20th century, the nature of disasters changed. Today, the prevalence of large technical systems and widespread environmental degradation such as climate change and plastic pollution mean that disasters are occurring more often, on a greater scale, and with longer term and even unpredictable effects compared to preindustrial periods. As science and technology studies (STS) scholars have pointed out, cases of disaster, whether extreme weather events like Hurricane Sandy or long-term, “slow disasters” like plastic pollution, engender a range of scientific and technical activities, including research, data collection, policy interventions, technological and infrastructural development, expert-lay collaborations, and the reorganization of knowledge networks. My work in disaster STS focuses on slow disasters, data practices, and the ethics of collaborations between researchers and on-the-ground relief efforts. I am a co-founding member of the Superstorm Research Lab (SRL), a mutual aid research collective working to understand the changes in how New York City policy actors, NGO leaders, activists, volunteers, and residents are thinking about social, economic and environmental issues following Hurricane Sandy. We produce traditional academic articles, but we are also pushing the boundaries of what it means to do scholarly work founded on the desire to create change. I am a co-founding member of the Disaster Collaboratory, a hub for researchers and people involved in on-the-ground disaster management to share ideas, knowledge and experiences. We aim to foster innovative forms of knowledge creation and support resources developed by those not normally recognized in traditional academic literatures. Our research aims to link research to action, and create action-informed research. I am a member of the Disaster-STS Research Network, which was formed to connect researchers, educators and other stakeholders in disaster, aiming to animate collaboration, methodological and theoretical innovation, and the translation of research findings into education and policy. 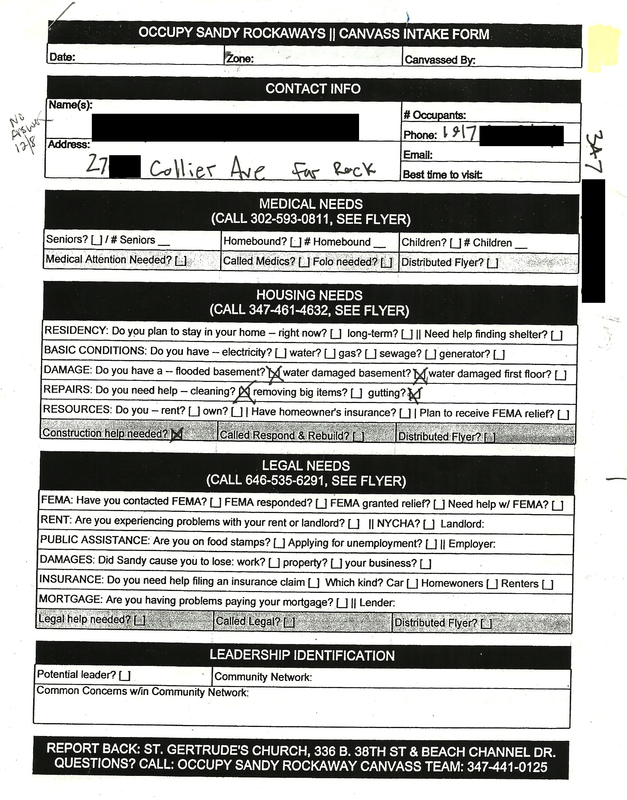 Example of a canvassing intake form used by Occupy Sandy following Hurricane Sandy’s landfall in New York City, 2011.